10 Years of Byron Hamburgers. You may or may not know that today, 23rd August is actually National Burger Day. 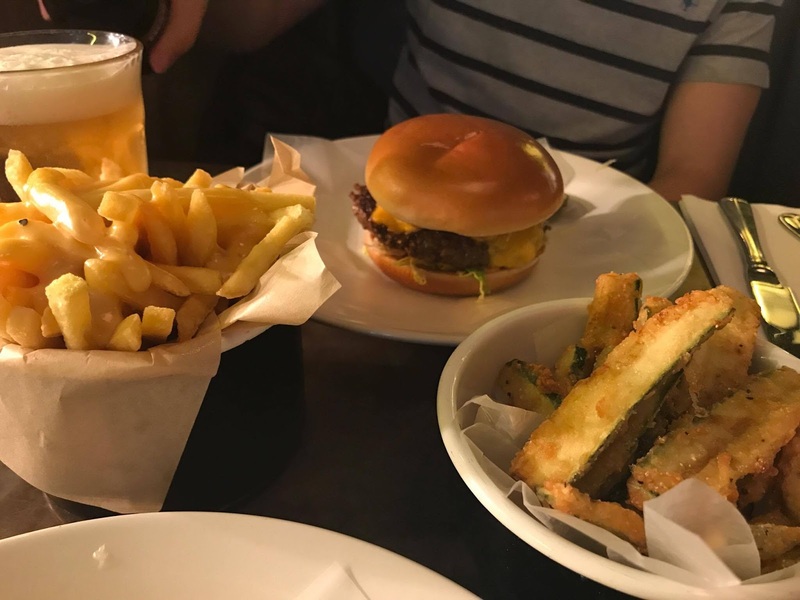 So, what better way to celebrate than a blog post all about Burgers! Earlier this week, I was invited along to Byron which is just next to the food court in Derby's intu Centre. I reviewed Byron last year which you can view here and I had a fantastic experience so naturally, I couldn't wait to return. 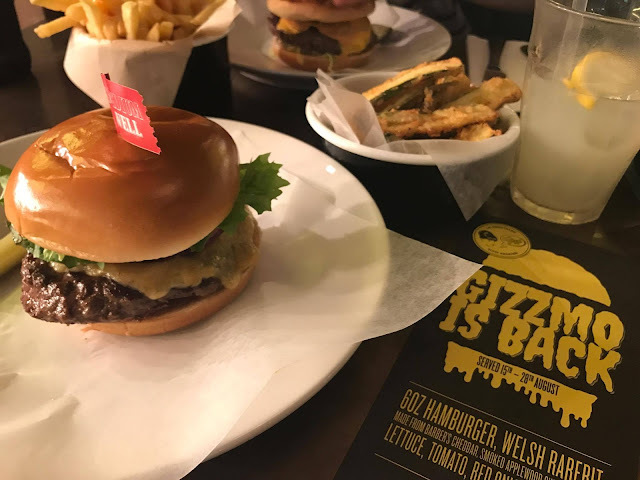 Byron are currently celebrating their 10th birthday and to mark the occasion, have bought back a much loved limited edition burger, Gizzmo which was created by celebrity chef Gizzi Erskine and comes topped with Welsh Rarebit, Smoked Applewood Cheese and all the classics such as Tomatoes, Lettuce and Mayonnaise. Alongside the Gizzmo, diners can pair a special Beavertown Brewery beer which has been created purely for the big birthday bash. I decided to bring along my brother, Camden as he's possibly one of the biggest Byron fans I've ever met. We arrived at 7pm and we were taken to our table just opposite the kitchen. 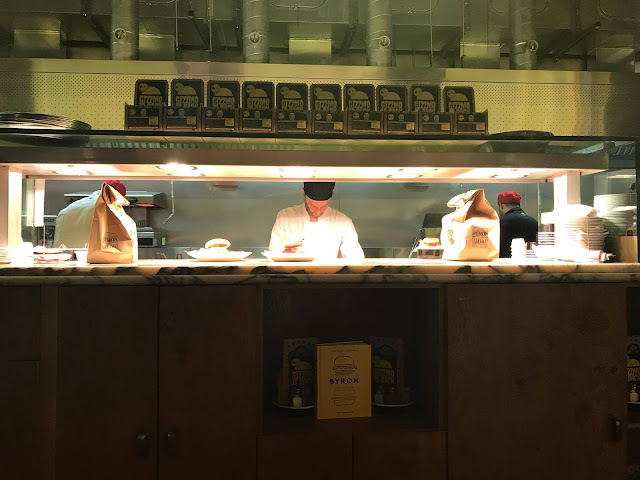 It was great being able to see their chefs hard at work. 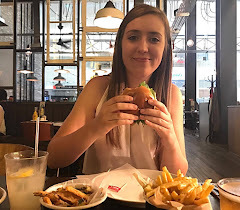 After a catch up with some blogger friends and a snoop of the menu, I thought it was only fitting to try the Gizmo burger seeing as it goes down such a storm whenever it's reintroduced to the menu. Sides are all separate and I've been a big fan of their Courgette Fries ever since my first visit so they were definitely a must. The Gizzmo was great! My favourite burgers have to be Cheeseburgers and this was sort of like an extra special one with the fancier than usual cheesy toppings. I asked for my patty to we medium well as I find medium a little too bloody for me and it came out perfectly. My Courgette Fries were as heavenly as it remember and with a Fresh Lemonade by my side, I was loving life. 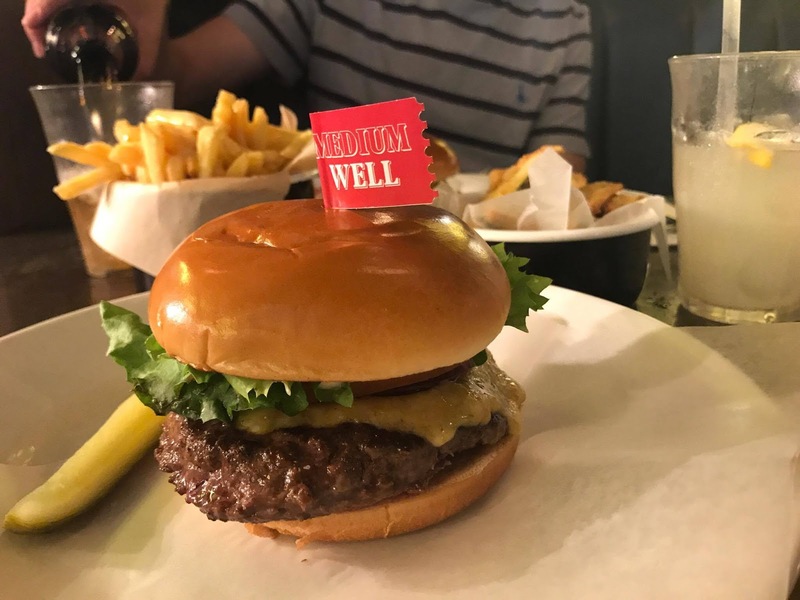 Camden went for a Chilli Burger which as you can guess, comes with Green Chilli, American Cheese and Chipotle Mayonnaise for that extra little smoky heat. The Chilli Burger really does pack a punch and is perfect for every spice seeker. He ordered a side of Cheese Fries which I couldn't help but steal a few of. The fries themselves were lovely but the cheese didn't really add anything for me. Onto dessert and I was so torn between choosing one from the menu or going for one of the fabulously sounding milkshakes. 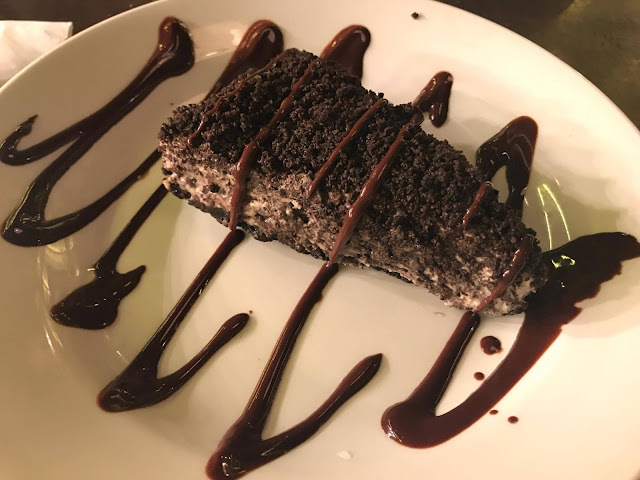 In the end, I went for their much loved Oreo Cheesecake which has an Oreo biscuit base, how cool is that?! I'm a huge choccie lover so this one was a winner in my eyes. 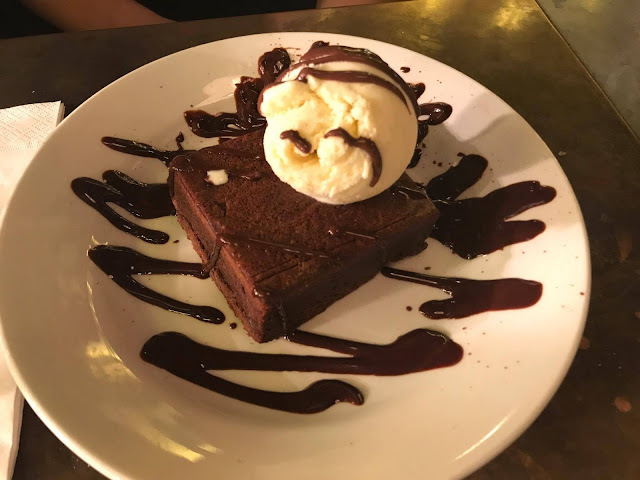 Camden had a Brownie which is served with a generous scoop of Vanilla Ice cream. One thing that did strike me was that alongside these two desserts, the only other option was Ice cream. The dessert menu doesn't have that much choice, especially if you aren't a fan of chocolate. Yes, I know there are milk and freakshakes available but a slight bit more variety would have been nice in my eyes. Overall, another great visit to Byron. Food, Service and atmosphere was all top notch. I had a blast celebrating their 10th birthday and how more perfectly timed can you get than for it to coincide with National Burger Day? Id love to know where the best burger you've ever had was. Let me know in the comments!